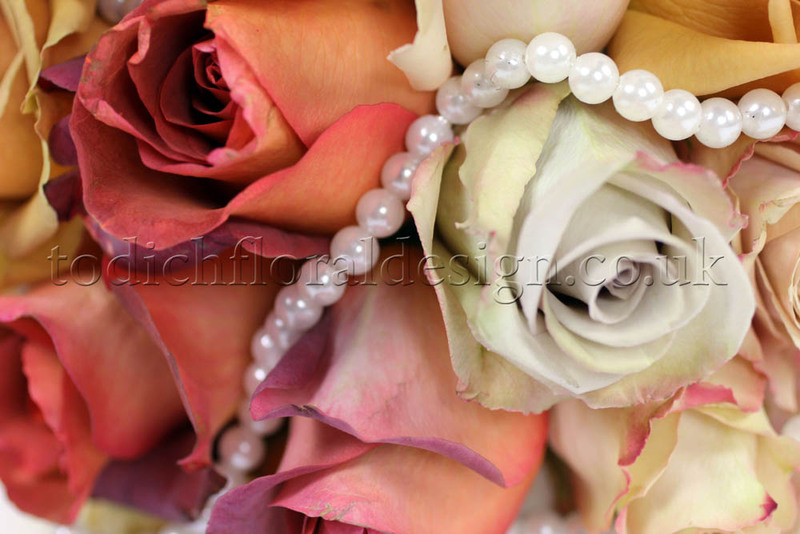 TFD » Blog » Posts tagged "january wedding flowers"
If you’re having a winter wedding in January or February this doesn’t mean you have to go with a typically wintery white colour scheme for your wedding flowers. This London bride who got married last January chose a gorgeous combination of warm, burnt-orange coffee break roses for her bridal bouquet, combined with paler peaches and creams along with splashes of dusty grey amnesia and touches of pearls to create a cosy, vintage feel. Roses are a firm favourite for romantic wedding flowers and for creating soft, feminine, country garden and vintage style wedding bouquets. Along with peonies, they are one of the most frequently requested wedding flowers at London florist Todich Floral Design, and it’s not difficult to see why. 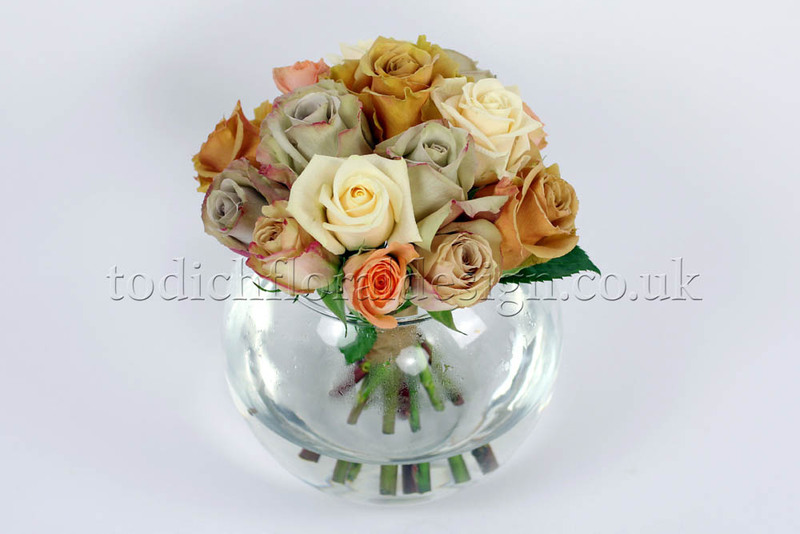 Not only do they come in a huge variety of colours and shapes, they are very versatile and work well with most other flowers too. From wild looking garden roses and delicate spray varieties in sweet pastel hues, to bright oranges, reds and pinks, and the classic white avalanche, roses are perfect for a variety of wedding flower styles and colour schemes. We love how the bright orange of the coffee break roses in this bride’s bouquet was complemented and toned down with the gentler peaches and creams and how the dusty amnesia added a nostalgic vibe. A delicate string of pearls was added and trailed around for a touch of elegance and to create a vintage style. 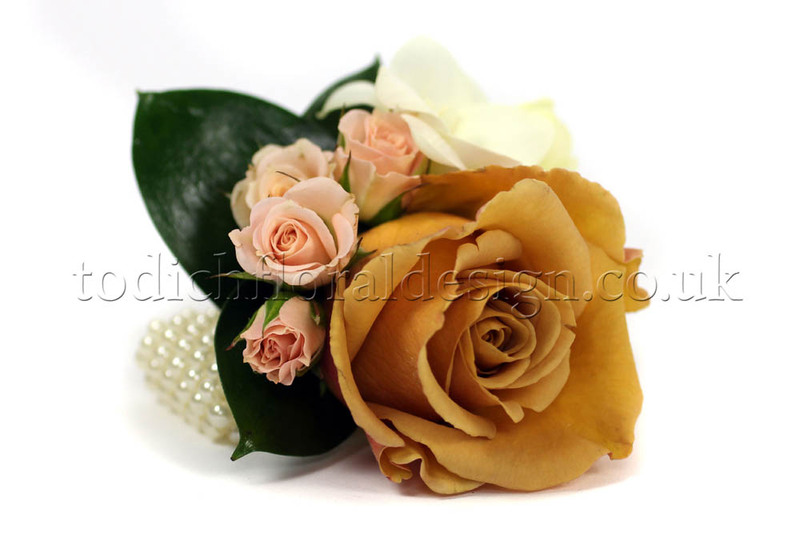 The wedding buttonholes and corsages complemented the bridal bouquet by picking up the hints of peach and pearl decorations, with ladies’ corsages featuring a pearl covered stem and mens buttonholes, an elegant pearl pin. Wedding reception flowers were kept simple and sophisticated, with posies of perfectly domed hand-tied roses set in classic shaped fishbowl and glass cube vases. These were in keeping with bride’s dress and overall theme for the day which was very feminine and classically chic. 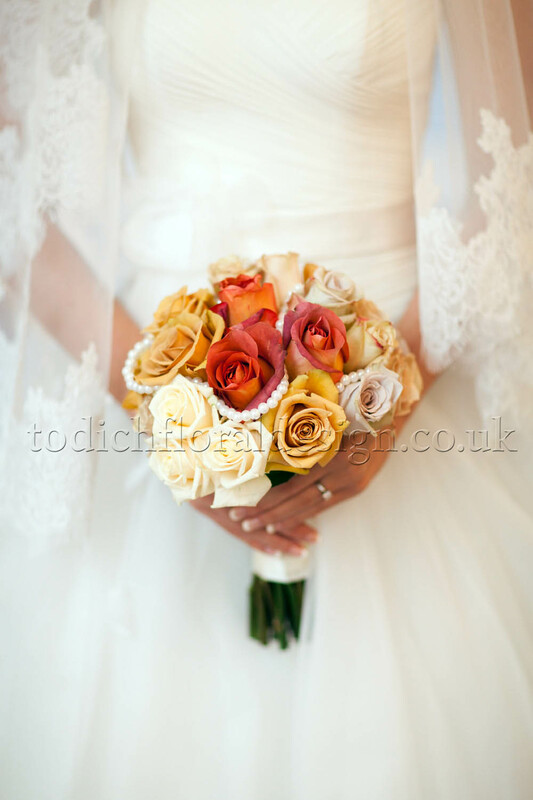 Whatever style of wedding you're planning, whether its modern, retro, quirky, rustic or completely unique, Todich Floral Design can help you create the perfect weddding flowers to complement your special day. Contact our weddings team now to discuss your ideas or request a quote.